This is a question that I worked on for one of my customers awhile back, but I was giving a talk on extending the SQL MP this week out in Redmond so it seems like a good time to get this one on the blog. SQL Server Log shipping allows you to automatically send transaction log backups from a primary database on a primary server instance to one or more secondary databases on separate secondary server instances. 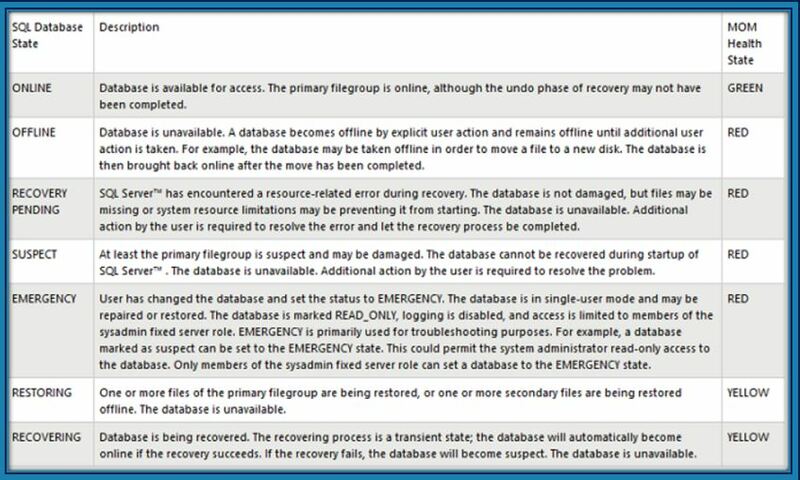 -Provides a disaster-recovery solution for a single primary database and one or more secondary databases, each on a separate instance of SQL Server. -Supports limited read-only access to secondary databases (during the interval between restore jobs). -Allows a user-specified delay between when the primary server backs up the log of the primary database and when the secondary servers must restore (apply) the log backup. A longer delay can be useful, for example, if data is accidentally changed on the primary database. If the accidental change is noticed quickly, a delay can let you retrieve still unchanged data from a secondary database before the change is reflected there. So in the case of Log Shipping the issue is that for the secondary database “Restoring” is normal behavior for a log shipped DB, but it would not be typical behavior for a standard database. So you get Warning Alerts because the monitor isn’t smart enough to detect the difference between a log shipped and non log shipped DB. It is very simple, but it isn’t mirroring or log shipping aware. This code + a little XPathQuery logic at the end of the MP fixes the false warning alerts for mirroring, but a secondary log shipped database still shows up as a Warning today in the current release of the SQL MP. Modify the XPathQuery so that -IsLogShipping is a Healthy condition. And then you have a nice custom LogShipping & Mirroring aware Database Status Monitor. I tend to isolate the monitor and any dependencies into a standalone custom MP and then disable the out of box Monitor.